Even with temps in the low 30's yesterday morning, it was fairly dry, so I figured it would be a good time to bundle up and get some winter miles on the bike. I headed up to Hudson first and met Brent and his girlfiend Sarah for coffee, then decided to head towards Ravenna to check out the Portage Hike & Bike Trail, to scout it for possible use on future sub 24-hour overnights. I took Ravenna Street from Hudson. I discovered this road last summer; it's a great road for getting around in that area and avoiding the more heavily-travelled roads. It crosses Stow Rd, which can take you into Stow. It crosses Seasons Rd, which is a back way to get you into Streetsboro, and it crosses Rt 43, which you can take into Kent. I crossed Rt 43, where Ravenna St becomes Ravenna Rd. I turned onto the Portage Hike & Bike Trail at Towner's Woods Park, and headed west on the trail towards Ravenna. I followed the trail for its four-and-a-half miles until it ends at Chestnut Hills Park, then turned around and rode back to Towner's Woods. A light sleet started to fall on my way back. I then took the additional section of trail that goes for a little over half a mile west to Lake Rockwell Rd, which is not really convenient to anywhere. This trail is in good condition, and is a worthy destination for families and other casual riders in the area. But, it will be more useful for commuting and touring once its full length is completed and the connections to other existing trails are made. I took Lake Rockwell Rd a short distance back up to Ravenna Rd and started to head towards home. I remembered a diner in Kent that I've passed a few times and have been wanting to check out, so I decided to make my way there. As I made the left on Rt 43, the sleet got a little more substantial. I passed a group of golfers teeing off at the Oak Knolls Golf Course, and I wondered which of us qualified for the day's craziest outdoorsmen award. 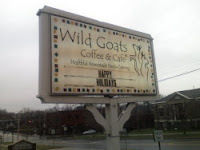 The diner is called Wild Goats Coffee & Cafe, and it's right on Main St near downtown Kent. The pancakes were decent, the coffee was dark and rich, and the service was friendly. The sleet had passed by the time I finished eating, so it was a dry and pleasant ride on the Summit Bike & Hike Trail back to Peninsula.